The best Portuguese schools: should we trust the rankings? Every year, the rankings of the best Portuguese schools are published and disseminated throughout the media. The indicator used to organize such ranking is the average national exams score results. The analysis of schools according to such rankings has received, over the past few years, a large criticism. This year was no different: after the announcement, the controversy came up again. A thorough analysis of the results would be interesting, but for lack of space, there are two consequent conclusions I would like to emphasize. First, private schools continue to have on average much better results than public schools. To illustrate this idea just notice that there are only 9 public high schools in the top 50, while in the similar ranking for the 9th year there are only 7 public schools. Regarding the 9th grade, this difference is quite visible in the following figure. Secondly, analyzing only the results of schools where there were over 50 tests, the results show a large difference at the territorial level, being the first places dominated by schools in the North Coast. The results and consequently the corresponding rankings are undoubtedly objectives; but their interpretation is far from consensual. The debate is on whether we should use this indicator as a measure of school performance. In my point of view, these results should not be used, in a decontextualized way, to assess school performance. In reality, this indicator does not take into account that schools have different characteristics, both in terms of social environment and in terms of human and material resources. Because of this, there is a huge literature that points out to the weakness of this indicator. In particular, it is interesting to consider the Rita Azevedo’s WP (2011) regarding Portuguese 9th grade exam results in which the author found evidence for a significant causal effect between socioeconomic aspects and school achievement. The conclusion reinforces the weakness of the indicator for the Portuguese case. The data released by the Ministry of Education shows also socio-economic indicators of public schools (not revealing any information on private schools). Based on this information, the Público’s study divided schools according to economic contexts and calculated an expected value of the average results for each context. Based on this, I think it would be more appropriate to use an indicator which compares the expected average test scores results with the obtained values (in this line, Azevedo also proposed that an alternative solution would be to consider the ratio between the expected value and the current average school scores). Although it has some limitations, it would help to draw more truthful conclusions regarding school performances. However, I cannot deny the importance of the divulgation of the results obtained by the students, because they are a key tool to make comparisons, within the same school (comparing with the previous years) or even between schools at the same context. However, we have to take into account that a comparison over time requires that the tests are comparable between different years which may not be the case of Portugal. Moreover, they are important for the government to be able to identify and combat the causes of the poor performance of some schools and regions. To conclude, the results should be presented to the public opinion in a careful way; the media should not label the rankings as “the best Portuguese schools”. It is important that the public opinion realize that a school cannot be considered good or bad based only on the average test scores. This conclusion is not only relevant for Portugal since there are other empirical studies that find the same evidence for different countries. Categories: Economics, Education | Tags: economics, education, grades, Portugal, rankings | Permalink. Are patents blocking Health Care innovation ? Pharmaceutical Industry may be described ambiguously as innovative but also guilty for blocking innovation when patents and trademarks enter the scene. Are the high profit patents involved in the commercialization of new health care solutions (drugs, medical devices, even empirical knowledge or molecules) fare? Since we were born we have been confronted with social and media pressure towards such organizations, acclaimed hazard and cause of negative economic and political influence (e.g. many Hollywood movies are based in this fact) sustained by lobbies and recurrent scandals . Such corporations rely their business on a strategy of impetuous R&D in order to overpass their direct competitors and enjoy the benefits conceded by the trade related aspects of intellectual (or physical) property rights, rather than primary target ethical and social care since they are profit organizations. The existence of rewarding patents serves a meritocracy system for innovative ideas and physical developments, but the question that arises here is how to define this plan and how to correctly implement a system that does not harm who invests but should not at the same time overprotect it. Currently, a development in ‘fields of technology’ is granted by 20 years of enforceable public interests which is converted in a stimulus for R&D, but at the same time prevents physicists/scientists from accessing to innovative patented materials/methods – this problem of obstructing innovation is entitled “anticommons problem”. Why should people pay higher costs in order to convert previous R&D investment into huge revenues for patent owners? From my point of view it is important to redefine this limit. Both values are partly subsidized by universal taxes and compete against other laboratories that provide different treatments (observably the supply of cutting edge treatments is not targeting everyone). There is in the Portuguese market a new trend of centralizing purchases in order to reduce total spending which implies that hospital administrators must choose one alternative. While screening the treatment protocols; one of the most important factors is its price. As we cannot find generics or other producers with similar drugs appearing in these markets it delivers all the binding power for the supply side. This is a mere example of an industry that is highly protected by patents that forces tax payers; hospitals and users are paying more than what the price market should be in a regulated market (where differences in some cases are disturbing). My final suggestion goes towards the regulation of this market based on a reallocation or an adjustment of the premises used to compute the economic calculus of compensating patents. One reduction on time like releasing the patent after 10 years and other producers/users of the development would have to pay a fee to the patent owner, this fee would suffer a gradual reduction over the years in order to grant surplus for innovative ideas but at the same time not struggling the market and not discarding social and health care. The war for patents would exist still and the system would obviously compensate the ones who innovates (e.g. exemption or reduction on taxes), but the economic calculus to compute the protection granted should be urgently revised. – 2000 Panel Report: Canada – Patent Protection of Pharmaceutical Products. – “WTO TRIPS implementation”. International Intellectual Property Alliance. Retrieved 22 May 2012. R&D is inhibited by the presence of many intellectual property owners’ exclusive and possibly conflicting rights over devices and methods needed to perform R&D on biomedical products. 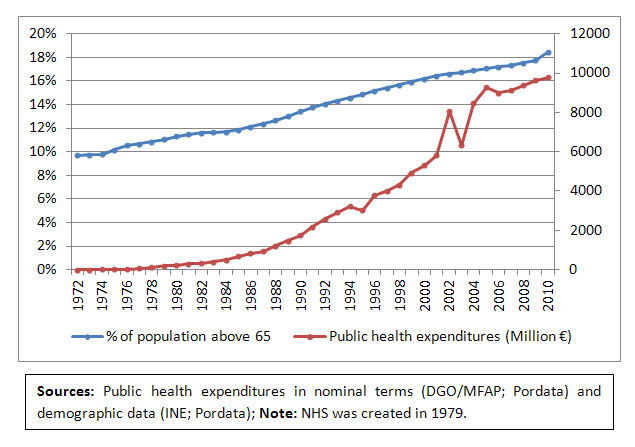 Categories: Health Economics | Tags: health economics, Portugal, public health expenditures | Permalink. Nowadays, if we compare the front pages of the main Portuguese newspapers, in all of them we will find the two most currently used words: crisis and austerity. Etymologically, these words remember us that we are living a decisive moment in which we need to adopt rigorous procedures. Education, Social Security and Health – the largest Ministries in terms of public expenditure – are now facing a strong budget constraint. A special attention is devoted to Health due to the sector specific characteristics, and where the MoU predicts for 2012 that costs control will allow savings worth €550Million. Since we are significantly cutting public expenditure, does this mean we will have a worse public healthcare sector? This is a legitimate question that everyone might ask. Indeed, these are changing times, but they are also challenging. As a science, Economics should offer its contribution. How? Economics studies the adequate use of scarce resources to satisfy theoretically unlimited needs. Economic analysis should work as an auxiliary tool in the decision-making process. It is important to know what is behind the trade-offs, which are the social preferences and which criteria we should set. In order to improve efficiency in the sector, the best choices and the definition of priorities should incorporate all these features. Will this be painless? No. In order to induce a more rational use of the services and also to control expenditure, higher moderating fees will severely affect those who lost the exemption and those many others with a more inelastic demand for healthcare. According to the press, in some public hospitals, the reduction in intermediate consumption is already noticed and some basic materials have now become scarce (bandages, syringes, antiseptics). The adoption of innovation in the NHS is also more difficult when we are facing a more visible budget constraint. Since many physicians are now suffering the consequences of austerity, they might prefer to definitely change to the private sector, earning higher wages and benefiting from better working conditions. Does this raise equity concerns? If I were to a public hospital in January, am I sure that would I be treated equally as if I were in December when the budgetary limit is more evident? How will the aftermath of the adjustment program be? Some might propose that, in the future, public health expenditures should have a constitutional limit as percentage of GDP in order to introduce commitment. The debate between rules and discretion is not new. We know that flexibility allows the reaction to unexpected shocks (a new deadly disease). However, we are also aware of the dynamic inconsistency of optimal plans. Usually, governments change their preferences over time and what was considered optimal in a certain point in the past may be considered inconsistent with what is preferred at another point in time. The problem is that preferences change without having any new information that was not possible to anticipate in the past. In summary, flexibility – the main advantage – becomes the main argument against discretion. However, this is what we learn from Public Economics: in thesis, rules are preferred to discretion. But now suppose: would it be difficult for the deputies in Parliament to congregate efforts and change the limit? 2/3 would be enough. And moreover: which limit should be set? Who will be responsible for calculating and monitoring? More recently, do we have any tradition of compliance with rules? This discussion illustrates how something theoretically good can, in practice, be inverted by reality. Categories: Economics, Health expenditures, Public Health Care | Tags: austerity, Portugal, public health expenditures | Permalink.